Creep feeding plays an important role in the life cycle of pigs. The practice introduces piglets to a solid diet while they are still suckling, and in doing so, helps them get off to a much better start. Beginning during the piglets first few weeks of life, solid feed promotes gut and digestive enzyme development. In turn, this enables piglets to digest nutrients from food sources other than that of milk. It is also intended to encourage feed intake in post-weaning that can positively affect production in the pen and increase yields. 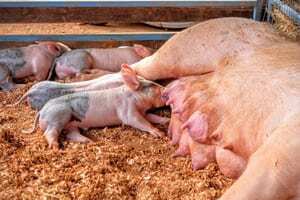 Creep feeding is a transition strategy in swine production designed to successfully introduce piglets to a solid diet and prepare their digestive system for weaning. The importance of creep feeding cannot be understated. In the weeks after birth, piglets grow rapidly and are subject to environmental, social, and nutritional stress as their immune systems are still developing. Within three weeks, a piglet’s nutritional requirements outpace the ability of the sow to provide it. In fact, a sow’s milk production peaks in less than a month and then slowly declines. From pre-weaning in the farrowing room to post-weaning in the nursery, creep feeding is used to increase piglets’ nutrient intake and familiarize them with solid food prior to weaning. Though creep feeding cannot guarantee greater weaning weights, the main benefit comes from enhanced post-weaning feed intake and better development of the gastro-intestinal tract. Because weaning is such a stressful period for the piglet, creep feeding can prepare the gastro-intestinal tract and improve the overall health and well being as it enters the nursery. Recent research indicates that with higher quality creep feed and subsequent weaner nutrition, pigs perform and feel better. 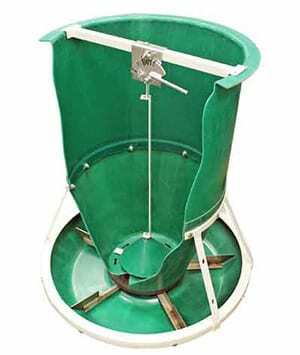 The challenge for pig production after creep feeding, is to introduce a pig feeder that can transition pigs easily. When Osborne introduced its all new FAST Start™ Big Wheel® Wean-to-Finish Feeder, it brought to market a one-of-a-kind pig feeder fully capable of starting pigs off on a healthy diet immediately after weaning. There is no labor, no adjusting, and no waste. FAST Start may just be the most efficient pig feeders ever made. Among other unique pig trough designs, FAST Start maximizes feed savings. It features all the no-waste, feed saving aspects of the Big Wheel family of mechanical-flow feeders, but operates in gravity-flow mode for newly weaned pigs. As pigs grow, it has a protruding horizontal lip on the feed trough to reduce feed waste and prevent overfilling of the trough. As a wean-to-finish feeder, FAST Start is the best choice for weaned pigs after they outgrow their mother’s milk and creep feed diet. The important role that creep feeding plays in a pig’s development should not be underestimated. Creep feeding prepares the gastro-intestinal tract of piglets, improving the animal’s overall health and well being, which subsequently increases pig performance as it enters the nursery. The FAST Start wean-to-finish feeder is the best choice for swine production as your piglets are transitioning from a liquid milk and creep feed diet to the nursery and beyond. Easy access, and fresh feed in a stress free environment can easily increase your yields.